So the Internets have been burning like mad all day with rumors regarding BioShock 2: Sea of Dreams. The prevailing word since late last night, and what very much upset many people, was word that the iconic Big Daddies - the diving-suit clad monstrosities that protect the Little Sisters in Rapture - would not be in the upcoming sequel to the 2007 first-person shooter. 2K Games came out this afternoon and said that the rumors were false. A few hours later, we now know that 2K isn't kidding. You play as a Big Daddy. In fact, you're the first of the lot, a so-called "renegade" Big Daddy who's on the hunt for a Little Sister of his own, according to a tipster who has the new Game Informer magazine in hand. You'll take out rival Daddies with your huge hand-drill and plasmid powers, claiming their wee sidekicks as your own. Similar to the first BioShock, you can choose to either harvest your Little Sister prize for ADAM or you can adopt her as your own. That Little Sister comes in handy. She'll harvest ADAM from corpses strewn about Rapture, acting as a warning sign for when the Big Sister—the lithe, lightning fast enemy who will hunt your character throughout the game—has you in her sights. Based on her description, it sounds like she'll one hell of a fight. From what we've heard, players will have access to all the things that made the Big Daddy such a menace in BioShock, with the character upgrades and options available in the first game expanded to keep things interesting. More details can be found in the new issue of Game Informer, which will be appearing in subscriber hands any second now. 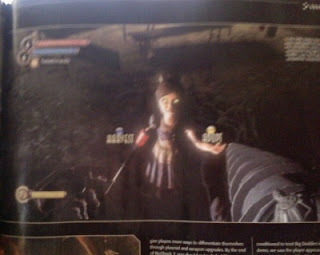 And Gameyko has snagged a few more details along with pics of the GameInformer magazine exclusive about BioShock 2. The one on the right indeed shows the player with the drill arm of the "Bouncer"-type Big Daddy. Hurm... don't know what to think about this. I love BioShock, have become a huge fan of its thought-provoking lore. But the notion of playing as a Big Daddy... aren't those things intended to be big dumb brutes that are no longer fully human? A videogame where you kidnap little girls? The article says it's the very first Big Daddy that we'll be playing, a "rogue" one. Maybe he just had the strength enhancements and not the plasmid treatment that made zombies of the other Big Daddies. YES! Getting to be a real Big Daddy at last! The mag says that Fontaine Futuristics will be a level too. You want to be a Big Daddy?!? Scott, you did listen to the audio diaries in the original BioShock, right? I would have thought that just *pretending* to be a Big Daddy would be bad enough. Remember Tenenbaum commenting on how bad those suits smell? That's 'cuz of the rotting human flesh still sticking inside it. Big Daddies were subjected to HORRIBLE plasmid treatment, then had their skin flayed off so that the bare flesh could be steam sealed to the suits. Those things are not human anymore. And now we are going to play not just a Big Daddy, but the very first Big Daddy ever made.